Use arrows on troops, never crown towers unless they are extremely close to being destroyed and the match will be over in seconds, as they do less damage against them. Use arrows on large groups of very weak troops, like, Skeleton Army, Minions, Minion Horde, Goblin Gang. Don’t use it on Goblins or Spear Goblins or Fire Spirits as you will waste one elixir. Use something like Valkyrie instead. Skeleton Army is vulnerable to area damage dealers. Especially air troops as it cannot even attack them. Witches deal damage quickly. The X-Bow is even faster. Be a good clan member, do not just request cards, donate as well. Also help with the Clan Chest. Learn the speed of damaging spells. For example, arrows act quickly but a rocket is slow to damage. At the start of a match waiting for your elixir bar to be full before you start deploying units. And, wait for the opponent to do it first so you know which unit to deploy. Put elixir collectors near your crown towers so they can be defended. NO WASTING ELIXIR UNNECESSARILY! For example, if a skeleton army is going to die soon, don’t waste arrows if the tower can kill the remaining skeletons alone. Even though Mini P.E.K.K.A.s do good damage, they do not have lots of hit points. Valkyries can deal area damage. Use it to wipe out groups of ground weak troops. It is not ranged, though, so a Wizard would be better. However, Valkyrie has more HP. Princes are good against single troops but bad against groups. If you come across a lone prince, put down skarmy (skeleton army) if you have it. Don’t use air troops, because the prince might get a hit. Giants, Lava Hounds and Golems do not attack troops. But, they are durable and you can use them for assaulting buildings and even as a distraction while you do your stuff. 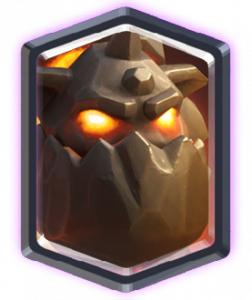 The troop that has the most HP at max level is Golem. The building that has the most HP is Barbarian Hut. The spell that deals the most damage is Rocket. You cannot control units once on the battlefield. When defending, use troops to pull your opponent’s troops in the center, so both crown towers can attack it. If your opponent has Goblin Barrel, save a spell for it. You can see where Miner and Goblin Barrel is going to go, so put down something in advance. Musketeer has lots of range and does lots of damage, but has low hit points. Hide it behind a tankier thing like a giant. Common cards are the easiest to get and upgrade. Rare cards are rarer and harder to upgrade; epic cards are even harder to obtain. Legendaries are the hardest to obtain. 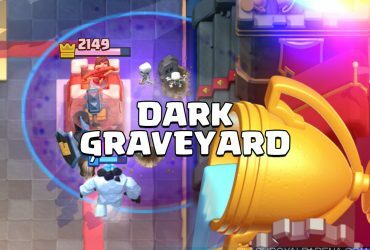 Put a Graveyard beside one of your opponent’s crown tower to get high damage before your opponent has time to save enough elixir for a counter (Hopefully). Arrows is my best counter. It takes only 5 gold to level up a common card from level 1 to level 2, but 400 gold for epic cards to do the same. When the shop has special offers, try to buy the offer before it is gone. They will benefit you highly. If the shop offers a legendary chest for 500 gems, get it. Fireball also can knock a troop backwards, in addition of dealing damage. Use this to buy you time. The Log knocks ground troops back more. Rage, Freeze, Poison and Arrows affect a large area but spells like Rocket and Fireball affect a small area. When there is only 1 minute left of battle time left and you more crowns than your opponent, focus on defending your own towers. You don’t want the enemy to get a late comeback. If an enemy tower is close to dying, focus on destroying that tower if the score is a tie. You can always do a 2v2 battle for more crowns. It costs 1000 gold just to open your own clan. Such a big waste of gold. Actually, 1000 gold isn’t that much. You can get that much fast. Common cards are not always weak. Royal Giant is decent. Skeletons are amazing. In terms of cycling, and defeating a Sparky, not power. Legendary Cards also don’t have to be strong. You can kill Sparky using skeletons by surrounding them. You can kill Princess with a knight since it has more HP. A Mini P.E.K.K.A. is fast which kind of makes up for its low HP. If you have a Mortar, try to position it behind one of your crown towers because the Mortar is vulnerable if the enemy gets too close to it. The Mortar and X-Bow can also be used to attack the crown towers from your side of the arena because of its high range. If the match is a draw, you don’t get or lose any trophies. Practice with a new deck before battling with it. You can practice using friendly battles. The AI in training camp is not very good. Some people never go to the clan page, though. If you are in a pinch, you can use Training Camp. 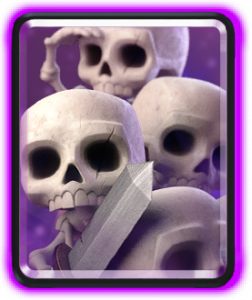 Use Zap to stun the opponent’s units for a very short time while, for example, a Skeleton Army is getting up to a Valkyrie or Bomber. If possible, use Minions instead of a Minion Horde because a Minion Horde can be defeated by Arrows for 2 less elixir. Every building has a lifetime, so it balances the crazy power of some, like the Inferno Tower. When a prince is charging, it deals double damage. Unfortunately, you cannot control when a Prince charges. During the last 1 minute and during overtime, elixir generation is doubled. This allows you to build up a big push. Be watchful of your opponent as well. A Graveyard isn’t like a Skeleton Army; It does not spawn all 18 Skeletons right away so by the time all the Skeletons are spawned so your opponent can Arrow it, the Crown tower is probably already defeated. Executioner is great, but if you don’t have something like that, just spam whatever troops you have. You might even be able to build up a counterpush. Never ignore the furnace, 1 fire spirit will get to your tower every wave, if the level is high enough. The princess has high range but it has very little health, you can kill it with even just a Knight. Never rely on your arena towers. They do little damage. The ice wizard slows down troops and the electro wizard stuns troops, giving you time to kill the enemy troops. However, the ice wizard` does very little damage, so don’t solely rely on it. The miner can go anywhere in the battlefield, great for attacking crown towers. 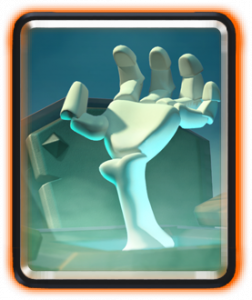 Use tornado to clump together all your opponent’s troops so they can be killed by a splash troop or a spell. The hog rider can jump over the river and flying troops will fly over the river. Classic Challenges and Grand Challenges give more gold and cards if you get more wins, however, they cost gems to enter. Classic costs 10 gems, and Grand costs 100 gems. But, try not to buy these, and try to enter special free challenges. You can get newly released cards from draft challenges. In draft battles, you choose one from two card options, for four cards. The other four cards go to your opponent. Your opponent does the same, so both players get 8 cards. This is a chance to play with cards from higher arenas than you are in. If you are in a classic challenge or grand challenge and you lose 3 times then you lose, if you win 12 times you win. The guards and the dark prince have shields. Even if you fire a rocket at them only the shields will die but they will be fine, so use cheap spells to knock out their shields instead of expensive ones like a rocket. Or, just place a splash or strong single. Sparky does an amazing amount of damage but takes 5 seconds to between attacks, so you can make it attack a skeleton, giving more time to kill it. But never leave it alone! It could be OP, so it’s legendary. However, many people agree it’s the worst legendary. 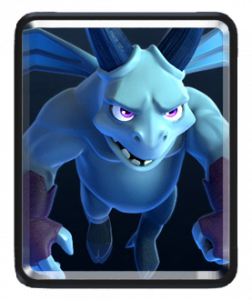 Although inferno dragon may seem weak, never let it go onto your tower, its attack damage increases as time goes on, and soon it will do huge amounts of damage. Distract the inferno dragon with small troops. Or, surround it with Minions or Bats. Legendary cards drop from the air when deployed. Use card combinations for assaulting crown towers, like the balloon-golem push. If you do not have these cards, you can use baby dragon instead of balloon if you have it and giant or royal giant instead of golem. A magical chest takes half a day to open and a super magical chest takes a whole day. A silver chest only takes 3 hours. The tank and splash combo is very effective. It could be anything, even just a giant and bomber could be deadly, or a PEKKA and Wizard if you have them. This combo works because the tank protects the splash troop while the splash troop kills anything they put down to kill the tank. To counter it, first use a spell to kill the bomber, then use a skeleton army to kill the giant. If your opponent uses the other one, then use a more damaging spell to kill the wizard like a rocket. It will also damage the PEKKA. Then, again use a skeleton army to kill the PEKKA. The Royal Giant can be hard to kill, since it has high range, high health, and only targets buildings. You can use an inferno tower to kill it, though you have to time it, because the royal giant has more range than the inferno tower. Tornado can be used to pull troops to the king tower, so that they activate your king tower. It also deals damage. Lava Hound and Balloon are a deadly combination, because they are both flying which makes them harder to defend against and the lava hound has high health, while the balloon deals high damage. They both only target buildings. Freeze can be very effective freezing their only counter to your troop, but be ready for a big counter-push, after the frozen troops un-freeze. Poison’s duration is 8 seconds. It is the best counter to Graveyard. Flying troops are better because not all troops can attack them. However, ground troops are better for distraction. The hidden tesla does not come up until a troop comes into range. While the tesla is retracted you cannot damage it. 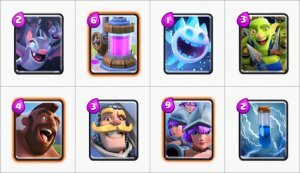 Since the tesla only comes up when there are troops in range, troops with long range such as princess or royal giant can not out-range it. Use spells. Buildings are especially vulnerable to troops with more range than it because they cannot move into range. Fire spirits are a great way to kill minion horde, while spending only 2 elixir to defeat a 5 elixir card. Make sure your fire spirits are good enough though! The log can kill many cards that cost more elixir than it, such as skeleton army, graveyard, goblin barrel, goblin gang, princess, dart goblin, and probably more. The downside is that you have to play a lot to get it, and it’s a legendary. One of the wooden chests you get in training camp has a guaranteed epic, but there are only 4 different epics you can unlock at the time. Silver Chests are the most common. You unlock legendaries at arena 4. The x-bow is very fast. 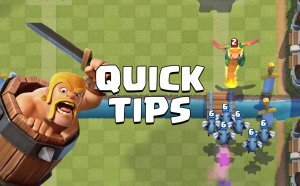 Use fast troops to speed past it, like Hog Rider and Spear Goblins. It doesn’t do much damage, though. If your opponent or opponents has/have two or more minion hordes, use tornado to pull them together and then use arrows to defeat them all. Six elixir to ten or eleven elixir! If you see people with cards from higher arenas than they are in, it is because they battled in higher arenas and got higher arena cards from chests. You have to be lucky to do this, though. Spells are usually better than troops because you cannot stop your opponent from doing damage. Use spells or ranged troops to kill Inferno Tower. Melee troops will probably die before getting into range. Unless they are splash troops. You will probably get rares in free chests. The trainers aren’t as smart as live players. So, for example, if you put down a Prince, don’t expect your opponent to not react. Zap also deals area damage as well as the 0.5 seconds freeze. Very little, though. A combination I made up is the range/melee/area damage army. 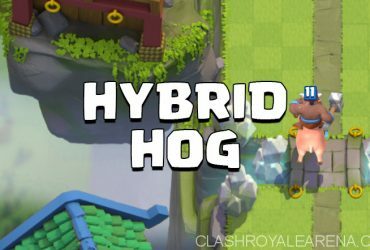 It requires valkyrie/wizard/anything else that can deal area damage, prince/mini P.E.K.K.A or another strong melee troop and a ranged troop or even building, like witch, wizard, archers, musketeer, royal giant, baby dragon, x-bow or inferno tower. Best with a splash troop, like a skeleton army or graveyard. It could be a waste of elixir, though. Use a goblin barrel for some quick damage. Your opponent should need about 2 hits from a tower to kill each goblin. Don’t use arrows on a couple skeletons or goblins, wait until your opponent puts down a lot and then use arrows for the best elixir cost. If your opponent has air and ground troops, the arrows won’t disappear after hitting the air troops and will continue to go down to damage/kill the troops on the ground. Mirror could be incredibly useful, especially during the last 60 (or 180 in a friendly battle or a clan battle) seconds. You can’t prevent your opponents from killing your units with spells, the way you can with troops. That’s why spells are annoying, and carry at least one or two in your deck. 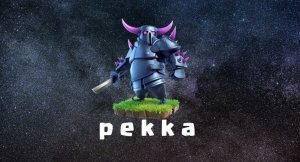 Many troops can destroy towers on their own if not dealt with, like P.E.K.K.A.. Always deal with enemy troops. For PEKKA, just use a skeleton army. One push is what I call the distraction push. 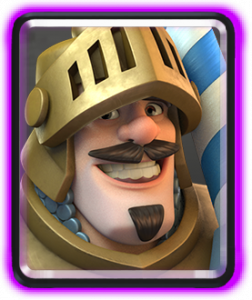 Since the towers can only attack one troop at a time, use a high HP card like a P.E.K.K.A. to distract the tower into attacking it first and then use a splash troop to kill the tower if the first distraction troop cannot kill it by itself. This only really works if your opponent does not defend much. You cannot get legendaries until arena 4. You can get cards of all other levels starting at training camp. Before battling, look at troops’ ranges. This indicates how far a troop can attack. As soon as something comes into range of a troop or building, it will immediately start attacking it. It will not go closer if it is already in range, for troops. There are currently no legendary buildings. There are epic ones, though, like the X-Bow. The only legendary spells are The Log and Graveyard. Use a Goblin Gang if you have it, rather than Goblins and Spear Goblins, as you will save one elixir. Arrows could be very useful as it is pretty cheap and spans a large area. It does not do much damage, though. There are currently 12 arenas, excluding the training camp and the challengers. Some units like the balloon and the giant skeleton have death damage so try not to kill them near your crown towers. 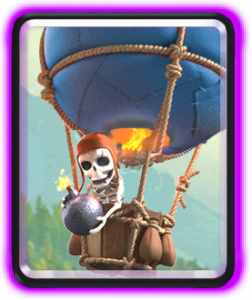 The balloon-giant skeleton push works because both drop bombs, so a lot of damage is dealt. The balloon’s bomb does much less damage than giant skeleton, but its normal attack does much more damage. Vice versa for the giant skeleton. The lumberjack drops a rage spell when it dies, so you can make it die quickly and rage your troops. The heal spell can heal troops, but it can not heal buildings and it cannot heal arena towers. Likewise, the tornado can pull troops but not buildings. The Tombstone drops four skeletons when destroyed so the cost is theoretically one elixir less. So, the Tombstone is two elixir. 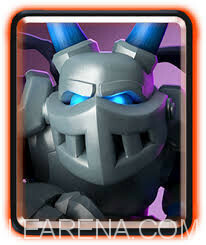 New cards also come out, like the Bandit, the Night Witch, Bats, Mega Knight, Skeleton Barrel, Cannon Cart, Flying Machine, Clone, Heal, Hunter, Zappies, and Magic Archer. In a clan battle, both you and your teammate can put down cards. The battlefield layout is unchanged from that in a regular battle, though. You unlock tournaments at level eight. Normally, if a unit’s hit speed is slow, it does a lot of damage each hit. For example, a P.E.K.K.A. takes some time between hits but it “swings from the hip but packs a huge punch”. When you put down a ranged building, it has a circle around it. It will disappear when you let go of it. This shows how far it can attack. It will only attack if a troop comes into range of the circle. A building’s lifetime will decrease even when it is not attacking. Most of the time, once you have an advantage you should focus on defense and not letting your opponent make a comeback. For the crown chest, you can always do another battle and get some crowns. You will get crowns for your crown chest even if you lose or tie a battle. Once you have 10 crowns, you can open the chest. Not all units drop a puddle of elixir when killed. Not all of these other things are functional, either. For example, Knight drops a sword, Executioner drops an axe if it dies before the axe reaches it, otherwise it will not drop an axe, Lumberjack drops a Rage spell, Tombstone drops four skeletons, Night Witch drops some Bats, Balloon and Giant Skeleton drop a bomb, Lava Hound drops some Lava Pups and Golem drops two Golemites and more. Princess has more range than a crown tower so it can kill it by itself is not countered against. Valkyrie damages everything it touches, even if it is not facing it. As long as a troop has high health and deals high damage, it can be a tank. Even a prince can be a tank. 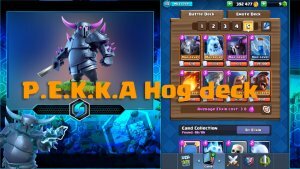 Other choices are giant, royal giant, PEKKA, giant skeleton, lava hound and balloon. Try to have tanks on the ground, though, as an air push is harder to accomplish but also harder for your opponent/opponents to counter/defend against. Bandit charges up for one charge attack as soon as an enemy unit spawns and then it just attacks normally. The Mega Knight also charges up for a jump attack and it does this for every new troop. This attack deals insane area damage, as it can kill three musketeers in one shot. You can drop spells anywhere in the arena though you can’t with troops and buildings. It is free to battle. (I am saying this because before you had to pay one gold to battle once. You can store up to two free chests at a time. When the Ice Spirit sees an enemy, it will jump onto it and freeze it briefly. The Fire Spirits deal area damage instead of freezing it. So, the Ice and Fire Spirits are more like a spell. The Princess is vulnerable if a troop gets too close. Like the Mortar. The Cannon Cart has a shield and if you destroy it, it becomes a cannon wherever the shield was destroyed. The Skeleton Barrel has the same functions though it drops skeletons instead of a cannon. And it flies. You cannot lose or gain trophies in 2v2 battles, however you can get chests and chat with your teammate and have a rematch with the same teammate, but with another 2 enemy players. The new arena is arena 11, now Electro Valley. Legendary Arena is now arena 12. The hunter does area damage over a wide area, but not much is dealt, and the hunter’s hit speed isn’t that great. 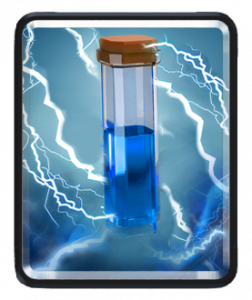 The Zappies can defeat many troops for only 3 or 4 elixir (I forgot how much), however, you unlock the card in arena 11 (Electro Valley), very far into the game. Higher arena cards could be better than low arena cards because more features are introduced. For example, Bowler and Executioner are better variations of Valkyrie and Bomber. However, some people still use low-arena cards, because of their unique abilities. It’s harder to get what you want in high arenas, because of the vast amount of possible cards. To get what you want, use Lighting Chests or Fortune Chests, or have your clan members donate to you. Or, just buy the cards from the shop. Sunday is Epic Sunday. You can request Epic cards, and you get a free Epic from the shop. You cannot ever request legendaries. Legendaries appear in your shop after arena 10. The most expensive card costs 10 elixir, and it is Mirrored Three Musketeers. 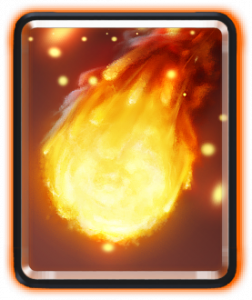 In Touchdown, use fast cards with lots of HP and does high area damage, and if possible, air. Use damaging spells effectively for example if you use a rocket at the end of a match when the opponent’s crown/king tower is at very low health but you’re opponent has a musketeer that’s about to kill you’re tower and you have enough elixir to summon an electro Wizard but you don’t then you will lose. Rocket takes 4 seconds to land on the other person’s arena tower. Use in advance! Only in high arenas is there a high chance of getting a legendary in a super magical chest. In arena 5, there is not even a 20% chance. You cannot get legendary cards in epic chests. Giant chests contain a lot of commons and rares, but few epics. The card shape of a legendary is different than of other cards. Wizard is not very useful if it’s surrounded by skeletons. Valkyrie would be better in that situation. If you’re lucky, you can get cards above your arena in a variety of ways. Executioner outclasses Wizard in every way, so switch to Executioner when you get it. Hunter won’t go closer if it’s already in range, so it might be hard for it to actually do the x10 damage.